Born in Belgrade, Mirjana Rajic studied under the legendary pianist Lazar Berman in Weimar and in Imola, Italy, in Belgrade under Srdjan Grbic and in Munich under Bianca Bodalia. She completed her piano performance degree with distinction in Dresden with Winfried Apel. She has also attended master classes with Andrew Ball, Aldo Ciccolini, Michel Dalberto, Rudolf Kehrer and Amadeus Webersinke. Mirjana Rajic has won prizes at various international piano competitions. Concert engagements have taken her to Germany, Italy, Spain, Serbia, France, Poland, Lithuania and Turkey as well as the United States, China, Japan and Singa pore. She has appeared at international festivals such as the Dresden Music Festival, the Ruhr Piano Festival, the Moritzburg Festival and at festivals in France, Italy, Lithuania and Serbia. In addition to her solo career, Mirjana Rajic is an avid chamber musician. Her chamber music partners are, among others, Pavel Berman, Saschko Gawriloff, David Geringas, Jan and Kai Vogler, Isang Enders, Mikhail Ovrutsky, Mikhail Simonyan and Quatuor Ébène as well as the Australian String Quartet. In addition to releasing several solo CDs, Mirjana Rajic has collaborated with Bayerischer Rundfunk, Deutschlandradio and Südwestrundfunk. 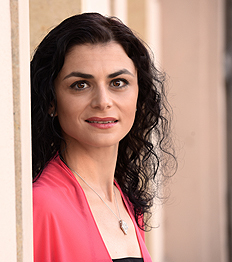 Mirjana Rajic has been a lecturer at the State High School for Music Carl Maria von Weber in Dresden since 2008 and since 2015 has been head of the piano section at the Dresdenʼs Carl Maria von Weber Secondary School for Music. She gives master classes in Germany, Serbia and France and is involved in the “Rhapsody in School” music outreach program for children and adolescents. Mirjana Rajic is in great demand as a juror for international competitions and is herself the initiator and artistic Director of the International Carl Maria von Weber Piano Competition in Dresden.